The snakeskin gourami (Trichopodus pectorali), is a large labyrinth fish, that despite its size is a highly sought after community fish. It was originally native to Thailand, Vietnam, Laos and Cambodia, but in recent years it has spread to Malaysia, Indonesia, Singapore, Papua New Guinea, India and the Philippines. In the wild, they are commonly found in sluggish or nearly stagnant water and inhabit ponds, swamps, rice paddies, but they are equally at home in rivers and lakes. They are almost universally found in environments with dense aquatic vegetation and they can often be viewed surfacing among the vegetation to take quick breathes of air. 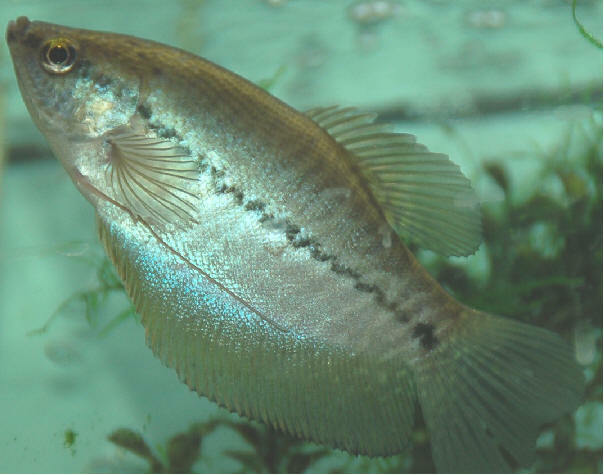 Snake Gouramis have a labyrinth organ, and with it they are able to breathe oxygen directly from the surface. They are also able absorb oxygen through their gills, but even in oxygen rich environments, you will often be seen taking breaths from the surface. They are one of the larger commonly available gouramis, and can grow up to 10 inches (25 cm) in the home aquarium. With that being said, most will only grow to 6 inches (15 cm), and it’s rare to have one that even reaches 8 inches (20 cm). The average snakeskin gourami will live 4 to 6 years in the home aquarium, and even in excellent conditions, it is difficult to obtain much longer lifespans. For such a large fish, Snakeskin gouramis are remarkably peaceful and do well in most community tanks. If they are being housed alone, or in a small group, they should be kept in at least a 29 gallon (110 litre) aquarium. However, if they are going to be kept in a community tank, they should be provided with a much larger aquarium to ensure that the fish are not overcrowded. While it’s not absolutely necessary, it is recommended that any tank containing snakeskin gouramis be heavily planted. This helps to recreate their natural environment and aquatic vegetation also helps to reduce their stress levels in captivity. Some easy plants to choose are Java moss, water sprite, water wisteria, hygrophila polysperma and Amazon swords. When choosing a filter for snakeskin gouramis, its best to use either a HOB (hang-on-back filter) or a canister filter. Usually an HOB filter is the better choice, since it combines durability and affordability to provide excellent filtration for the aquarium. I would strongly recommend choosing an Aquaclear Power Filter for a snakeskin gourami tank. This filter combines excellent filtration with a durable design, and it will keep your tank sparkling clear for years to come. You can also read the Aquarium Tidings Aquaclear Filter Review here. Snakeskin gouramis are omnivores, and feed on algae, plant matter, invertebrates, insect larvae and even some terrestrial insects in the wild. This diet should be recreated as closely as possible in the home aquarium, and this can be done through regular feedings of a high quality flake food, along with occasional offerings of frozen or live foods and vegetables. I personally recommend feeding them Hikari Micro Wafers, which is one of the best foods on the market. Their favorite live foods are blackworms, mosquito larvae (illegal to culture in some areas), bloodworms, daphnia and brine shrimp. If you don’t have access to live food, then you can feed frozen foods which are nearly as good for the fish. These include brine shrimp, bloodworms, daphnia, and blackworms or tubifex. As they consume large quantities of algae and plant matter in the wild, they should also be given regular feedings of vegetables. Some of the vegetables most readily accepted are blanched and shelled peas, zucchini medallions, cucumber medallions and peeled broccoli stalks. Make sure that all vegetables are thoroughly rinsed and blanched before they are fed to the fish (and make sure you allow them to cool thoroughly). Like many gouramis, breeding snakeskin gouramis is relatively easy. They are bubblenest breeders and the tank will need some preparation prior to the breeding. First, a breeding tank should be set up with only about 8-10 inches (20-25.5 cm) of water in the tank. You want to have as little current as possible, so a sponge filter generally makes the best choice for a snakeskin gourami breeding tank. The male and female should then be separated and conditioned for at least a week. They should be feed a diet rich in live or frozen foods, until the female begins to plump up with eggs. It’s vitally important that during the conditioning they can view each other, and the breeding is unlikely to succeed if they are conditioned out of sight of each other. After the female has plumped up with the eggs, the male should begin to construct a bubble nest. Floating plants, or some sort of artificial spawning mop must be provided, as these will allow him to anchor the bubblenest as he constructs it. Once the nest has been constructed, the male and the female can both be introduced to the breeding tank. Breeding will usually occur shortly afterwards, and the fish will be observed touching each other with their modified ventral fins. The male will then wrap his body around the females and mate with her under the bubblenest. After mating, the male will begin to collect up all the eggs and carefully place each one in the bubblenest. Several spawning’s may occur, with the male gathering the eggs up after each spawning. Once breeding has finished, the male will become aggressive towards the female, and she should be removed from the tank. The male will guard the nest until the fry hatch, and at that point the male can then be removed. The fry should be fed three times a day, and will only accept infusoria or green water to begin with. They can then be moved onto baby brine shrimp, or commercially available fry foods. While it takes a bit more effort and planning, most aquarists prefer to use newly hatched brine shrimp. Can snakeskin gouramis be with dwarf gouramis in a 30 gallon tank (2 of each). Unfortunately the tank would be too small for the fish to live in their peacefully. Also, while the snakeskin gouramis would likely be alright in that tank, dwarf gouramis can be very aggressive. You’d likely have aggression issues almost immediately if you tried that setup.